A denture is commonly known as false teeth as it replaces missing natural teeth. It can be made of plastic or a combination of metal and plastic. It can be taken in and out of the mouth by the wearer. By replacing missing front teeth, your smile would be complete! When a tooth is lost, other teeth tend to move or drift towards the empty space. This will result in awkward spaces that trap food and are difficult to clean. A denture can prevent this from happening. When natural teeth are missing, you need some help to better chew and enjoy your food. +HOW MANY TYPES OF DENTURES ARE THERE? These are called partial dentures. They usually have wires to help hold them in the mouth. These are called complete or full dentures. +WHAT ARE DENTURES MADE OF? Dentures made entirely of plastic are cheaper but not always better. Dentures that replace all teeth are usually made entirely of plastic. 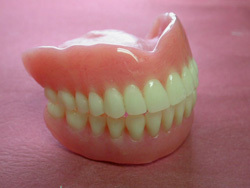 These dentures look just as good as the plastic ones but are stronger and last longer. It has a metal skeleton made of cobalt chromium – a hard, strong metal which does not rust or change shape. this material allows the dentist to design the denture better. Cobalt Chromium dentures cost more than the plastic ones but are a good investment. +IS IT IMPORTANT TO HAVE A GOOD DENTURE? Yes. A good denture will help you to eat better, speak better and look better. More importantly it will not damage the remaining natural teeth. +DO BAD OR WORN OUT DENTURES DAMAGE MY TEETH? Old dentures which no longer fit the teeth and gums accurately tend to sink into the gums and give rise to decay and gum disease. Over time, the wires may no longer be in the right place and may put too much force on the teeth. This can loosen the teeth. Dentures that are not properly made can cause your face muscles to get tired and make eating difficult. 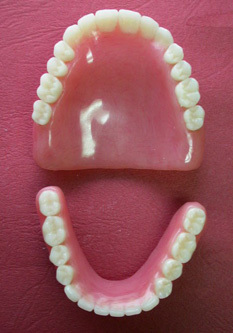 +IS THE DESIGN OF THE DENTURE IMPORTANT? Yes. Your dentures have to be properly designed to protect the rest of your teeth. +HOW DO I CARE FOR MY DENTURE? Take it out of the mouth to brush and rinse them after each meal. Clean it thoroughly by brushing and soak it in denture cleaner at least once a day. Clean with soap and water. Brush gently, Preferably with a denture brush. Some commercial denture cleansers may tarnish metal. Do consult your dentist as to which cleaners are suitable. Soak dentures in a glass of clean water at all times when not using it so that the dentures will not distort, i.e. change shape. +HOW OFTEN SHOULD I CHANGE MY DENTURES? Even if your denture does not break or if you have not lost more teeth, have your dentures checked every year. Every 3 years, change your dentures because the plastic wears down and the wires loosen over time. 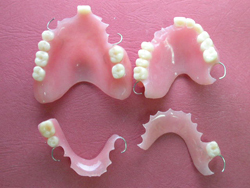 Broken or damaged dentures should not be worn. They are dangerous – make a new one. +WILL MY NEW DENTURES HURT ME? At first your new dentures may give rise to some discomfort but over time these discomforts should disappear. If you have any persistent discomfort (such as pain), go back to your dentist for adjustments. Your dentures need care just like your natural teeth. You and your dentist are partners in the maintenance of your denture. -WHAT IS THE DIFFERENCE BETWEEN A CROWN AND A BRIDGE? A crown replaces a part of the tooth seen above the gum. The crown is supported by the remaining tooth structure or root. A bridge replaces one or more missing teeth (i.e. the part above the gum) and is made up one or more crowns, which support and carry the replacement tooth or teeth. A typical bridge will be one that consists of two crowns, one on either side of missing tooth or space, carrying a replacement tooth. 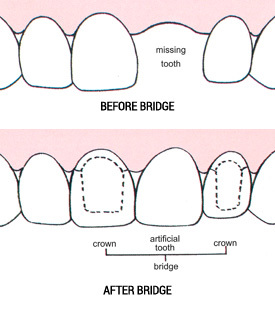 Most bridges have the supporting crowns and replacement teeth joined rigidly together in one piece. Can a bridge be removed by me just like a plastic denture can? No, a bridge is fixed as opposed to a denture, which is removable artificial teeth. As such, once cemented, a bridge is secure and should feel very much a part of you. However, in the rare instance when a bridge is to be removed, it may be done by the dentist, but only with some difficulty. Why does a bridge cost more than a denture? The time and professional skill required in the making of a bridge is very great. Add to these factors the cost of the materials used plus the laboratory or technician charges and the overall cost of the bridge exceeds the cost of a denture. A well made and well maintained bridge can be expected to last many years. I feel prematurely old now that I am wearing a denture. Will a bridge help me overcome this depressing feeling? If it is found that a bridge can be made to replace your existing denture, then the mere fact that a bridge is fixed securely onto your own teeth, and does not need to be removed for cleaning, will go a long way towards overcoming this feeling of premature ageing! The absence of wires or hooks, which many dentures have also helps in your confidence to talk and smile without fear of betraying the fact that you have missing teeth. Is it easy to maintain a bridge, i.e. cleaning it, etc. since it cannot be removed from my mouth? With proper instructions from your dentist, maintaining your bridge in good functional and aesthetic condition is not difficult, but requires a little effort and time. This routine can be incorporated in your normal tooth brushing time and does not significantly increase the time you spend cleaning your teeth. Correct cleaning of your bridge may include flossing, or the use of small brushes. With some practice and time, most patients do very well if they are sufficiently instructed and motivated. How long will the bridge last and must I go for regular check-ups? The lifespan of a bridge vary tremendously, depending upon numerous factors, which may present in different people. The need to have regular check-ups with your dentist cannot be overstressed, as very often minor problems with your bridge can be detected early and remedial action taken before the situation worsens and reaches a disastrous stage, which may necessitate a remake or even worse, an extraction and a more extensive bridge. Some friends have told me that bridges are bad as the supporting teeth invariably decay and have to be removed eventually. Is this true? No. The supporting teeth of a bridge will only decay if the bridge has not been properly maintained by the patient. From the outset, if a proper choice of teeth supporting the bridge has been made, then you should expect these teeth to last as long as they would have if they were not used as bridge abutments. Teeth, which are already suspect will of course, make poor bridge supports and therefore should not be used except in rare occasions. Conventional bridges or dentures may not be your only options when replacing missing teeth. For some people, dental implants offer a smile that looks and feels very natural. Implants are placed into the jawbone and serve as a base for individual replacement teeth, bridges or a denture. After implants are placed, they fuse to your bone. Thus, implants provide very stable support. Dentures, bridges or individual teeth mounted on implants won’t slip or shift in your mouth – an especially important benefit when eating and speaking. Integration of the implants into your jaw also helps your replacement teeth feel more natural. Some people also find the secure fit of implant-supported dentures or bridges more comfortable than conventional substitutes. -WHO IS SUITABLE FOR DENTAL IMPLANTS? Candidates for dental implants need to have healthy gums and adequate bone to support the implants; patients must be in overall good health and committed to keeping their new smile healthy with meticulous oral hygiene. +HOW LONG WILL THE TREATMENT TAKE? The placement process, i.e. implant surgery usually takes less than an hour. However, it is essential for the bone to heal by fusing with the dental implant, a process known as osseointegration. This healing phase can take about 3-6months before the restoration of missing teeth can take place. +HOW MANY TIMES DO I NEED TO GO TO THE DENTIST? Implant treatment can sometimes involve several dentists. For example, you may need an oral surgeon to place the implant and another dentist to make the crown, bridge or denture. A thorough examination and diagnosis is essential for the success of the treatment. You would also need to take some x-rays to determine whether there is enough bone for the implant placement. At a minimum, you may need to visit the dentist 5 times. +HOW MUCH WOULD IT COST ME? Dental implants generally range between $3500 – $6000 each depending on the complexity of the case. Consult your dentist for the exact cost of treatment. +IS IT WORTHWHILE TO SPEND SO MUCH FOR AN IMPLANT? Most people feel the investment is worthwhile and find dental implants to be the next best thing to their natural teeth and smile.